Afinia Label, The Narrow-Web Memjet Experts, announced today that they will be unveiling their new DLF-1100 Digital Label Finisher at Drupa 2016 in Düsseldorf, Germany, from May 31 to June 10 in Hall 06 / D08. The DLF-1100 will be an excellent, affordable option for laminating and cutting labels to any shape and size. The Afinia Label DLF-1100 laminates, cuts using a programmable plotter-style cutting mechanism, slits and rewinds. This allows the user to create labels any size or shape digitally, on demand, without dies, directly from a convenient Adobe Illustrator plug-in. It also will automatically adjust the die line to compensate for the shifting and stretching that is inherent in some label substrates. Afinia also offers several color label printers. The Afinia Label L801 Color Label Printer is powered by Memjet technology, which gives it a print speed of 60 ft/min (18m/min) and an industry-leading ink cost of less than 3 cents for a 4” x 6” (100mm x 150mm) label with 75% coverage. This is a fraction of the cost of other inkjet label printers. The Afinia Label R635 Color Label Printer is dry toner based and carries BS5609 Section 1, 2 and 3 certifications making it the ideal solution for full-color, GHS-compliant chemical labels. The NeuraLabel 300x is a pigment-based label printer that can output at speeds up to 100 ft/min (30m/min). Our Epson offerings can print labels from 2”(50mm) to 8.5” (216mm) at speeds up to 12”/sec (300mm/sec). Afinia Label emerged as a digital label printing system leader in 2012 when they collaborated with Memjet to co-develop a commercially viable narrow web label printing solution. 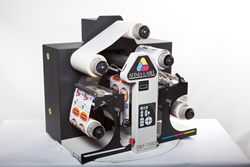 Afinia Label is now one of the largest distributors of Memjet-based label printers in the world.